The trend toward clean, renewable energy is decades old. Today, more and more states are turning to wind power to reduce the cost of energy. A manufacturing facility for a top supplier of turbine blades needed room to grow. The workload had increased, and an expansion was critical to augment production. This expansion was going to be tricky because the company couldn’t stop blade production during the construction of their expanded facility. They needed a partner who could supply a gap solution. They needed a quick turnaround and flexibility for manufacturing deadlines. 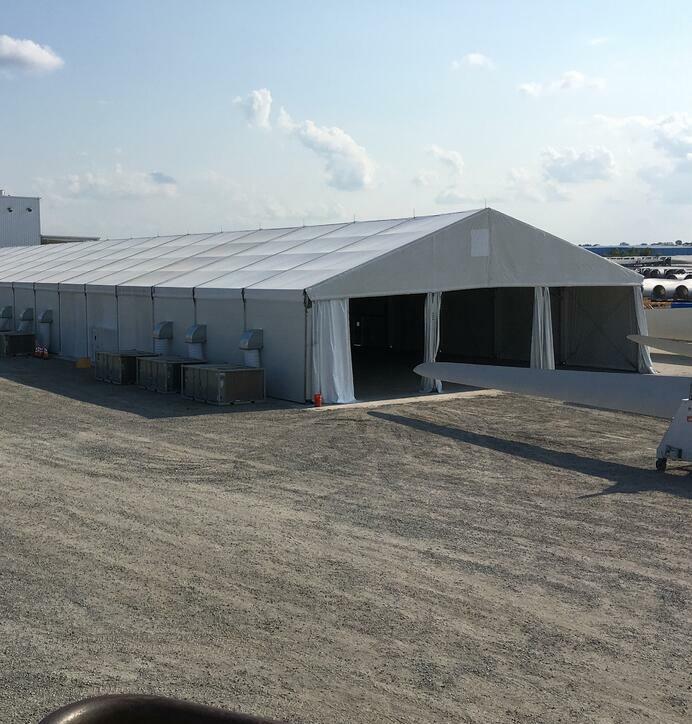 Mahaffey proved the best choice for the job based on experience with the customer, our more than 90 years of experience in building temporary structures for all types of industries and our expert designers, project managers and installers. The most challenging aspect of the project was that the Mahaffey team needed to install the structure in an active facility. At random times throughout the temporary structure installation schedule, the installation crew would stop while as many as three 75’ blades were brought onto the site and staged before being transported to the finishing area. Hours of time could be lost for any installation team. Fortunately, Mahaffey crews and project managers are the best of the best when it comes to keeping projects on time and on budget, even in challenging situations. We understand limiting downtime is critical in any operation, and our team was laser-focused on delivering a quality installation, on time, with minimal impact to the existing operation. This temporary structure would serve as the pre-finishing area for gigantic turbine blades, so it had to be a massive space. The client requested that Mahaffey install a structure on an existing concrete pad with space in length to allow more than one blade into the structure at one time. Additionally, they required openings at each end of the building to allow access for the 75’ blades. Lastly, the structure needed to adjoin their current facility and remain there for four to six months. The Mahaffey MegaStructure™ with 15’ uprights was the ideal solution for this project. The MegaStructure™ is an aluminum box beam structure with classic A-frame design. This industrial fabric structure is engineered to be sturdy and safe, even at massive proportions. It is best suited for semi-permanent applications of at least three months and is ideal for industrial projects, turnaround events and applications located in areas with harsh climate conditions. The solution for this client also included custom fabric openings at each end, HVAC and lighting. The structure was completed within the allotted timeframe, even with the logistical abnormalities of working with blade interruptions. The management team attributed the success of the installation to great communication skills across all levels. A month after completion of the project, the client asked that the HVAC be replaced with ventilation fans. The Mahaffey team quickly made the necessary changes to accommodate the request. The result of the “bridge the gap” structure was successful for everyone involved. The structure provided the client the necessary space to expand operations quickly, without having to wait until construction on their permanent facility was complete. Because the Mahaffey team was able to work around the client’s operations, downtime wasn’t an issue. This enabled the company to maintain and even increase production on an aggressive timeframe, and continue operations until the new facility was ready. How do you expand quickly to capture additional revenue without slowing down or stopping operations today? 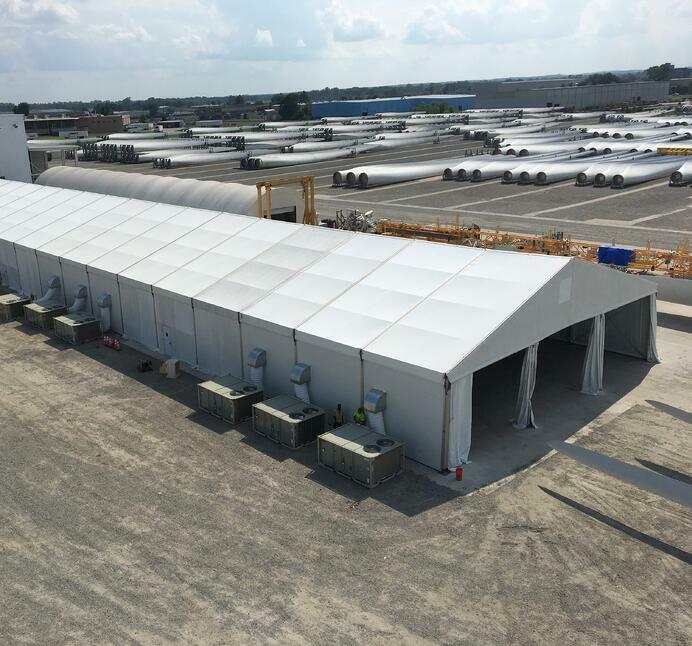 Temporary structures are an ideal business continuity solution, especially when you work with a vendor partner who knows your industry, listens to your needs, and makes recommendations based on your goals. Thriving in the field is a superpower of Mahaffey’s. We work in concert with you to produce the best structure possible for the task at hand—even when that means working around your operations. Mahaffey possesses the professional acumen necessary to know when to pivot, be flexible and use “boots on the ground” know-how to keep things moving forward regardless of challenges. The next time you’ve got a big job on your hands that requires a vendor partner with temporary structures expertise across all industries, call Mahaffey.